The 4-1-1: This isn’t the first time that an art gallery has opened in this space; back in 1967, brothers Alonzo and Dale Davis opened The Brockman Gallery, which played a pivotal role in the Los Angeles arts scene in the ‘60s,’70s and ‘80s, featuring the works of prominent African-American artists such as Romare Bearden. Last Saturday was the grand opening for the newest addition to Leimert Park: Papillion. Amongst the worldly tunes, courtesy of DJ Kaleem, an eclectic crowd and significant players in L.A.’s elite art scene congregated indoors and outside, with neighborhood passersby curiously taking in all of the commotion. And plenty to see there was. The main stars of the night were gallery owner Michelle Papillion, who gracefully maneuvered through the hundreds of guests, and the inaugural exhibit, O P E N. Featuring artists from the States, England, South Africa and Angola, this exhibit has plenty of intriguing pieces, from clay sculptures and hanging installations, to paintings and lots of colorful mixed-media projects. One of my favorites is Derek Fordjour’s Cheerleader (down), made of charcoal and pastel on newsprint and paper (pictured below). Papillion is the transformation of the Papillion Institute of Art (P.I.A. ), which originally arrived on the L.A. scene in Spring 2010, in the southeast part of downtown (You can read here my interview with Phonte of The Foreign Exchange/Little Brother that took place in P.I.A.). While the former space definitely had a more urban and industrial feel to it—with exposed bricks and beams—the same passionate commitment to showcasing art in the most revering and visually appealing manner has been transferred to the new, brighter and airier Leimert Park location. Like the former P.I.A., Papillion will host plenty of events in its two rooms and outdoor section that opens in the summer, including collaborative projects with the African Fashion and Art Week. It’s all just part of ushering in what owner Michelle calls the #LeimertParkRenaissance. Papillion is looking like it’s going to be a great addition to Leimert Park and I’m extremely excited to see how it will enrich the local neighborhood and add to the L.A.’s unique and rich story of the arts. So the next time you’re in the market for new art or are simply interested in looking at thought-provoking art, make sure to stop by Papillion. See you there soon! While most restaurants may have already filled up already for Valentines Day, there are still a few fun, unconventional ways to celebrate, including that night, the following weekend and for the entire month and beyond. Here is my #WilsonsGuide Top 6 list of recommendations for that special occasion. And if you already have Valentines Day plans, what are they? Share in the comment section below! 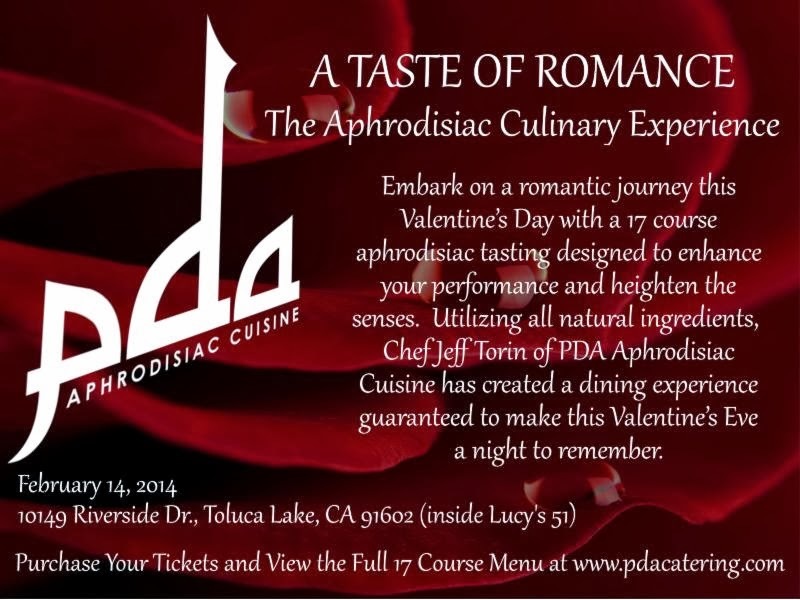 The Eats: L.A.-based Chef and Aphrodisiac Expert Jeff Torin will provide both an eight- and 17-course tasting menu, designed to "heighten the senses." Tastings include: Coconut & Plantain Crusted Prawns, White Chocolate Soup, a “Dirty Little Secret,” and more. The Vibes: Chef Torin explains: "While ingredients such as figs push higher levels of O2 into the blood, and spicy chilies use capsaicin to increase nerve ending sensitivity, others stimulate the senses through smells and taste like licorice, fresh herbs, and vanilla." Good for: Setting the mood for the rest of the night, after dinner. When-To-Go: There are two seating times: 7 p.m. and 9 p.m. The $ Factor: $75 Per Person ($150 per couple) for the 8-Course Tasting Menu; $120 Per Person ($240 per couple) for the 17-Course Tasting Menu. Includes dinner and a cocktail or glass of wine per person. The 4-1-1: Tickets must be purchased by Wednesday, Feb. 12; you can purchase them here. The Merriment + Eats: Acabar is providing both a “Strangers Mixer Party” for singles ready to mingle—with burlesque performances and a snake dancer—and, a four-course dinner menu for love-birds, complete with starters, entrees and desserts. Dishes include: Warm Lobster Salade, Chilled Oyster Vichyssoise, Honey Butter Cake and Chocolate Rati, amongst others. Good for: Singles and couples alike. When-To-Go: Dinner reservations are almost already all booked up, but there are still a few time slots, later in the evening. So, make reservations sooner than later. The $ Factor: The four-course dinner is $125; bottle reservations are available in the lounge where the "Strangers Mixer Party" will be. The 4-1-1: Acabar is truly a worldly, out-of-the-ordinary experience, with a Moroccan flair. Very romantic and sensual! The Merriment: One night of sultry, feel-good performances by soulful R&B artists, including: The Manhattans, The Delfonics, The Impressions, The Originals and more. Good for: Anyone who loves old school R&B and concerts; great to go alone, with a date or with a group a friends. The $ Factor: $34.10-$80.75, before taxes and ticket fees. The 4-1-1: Prior to the concert, the Honda Center’s Grand Terrace will have menu options designed for two, including Grilled Hangar Steak, Penne-ala-Vodka and a special Valentine’s Day chocolate dessert menu. 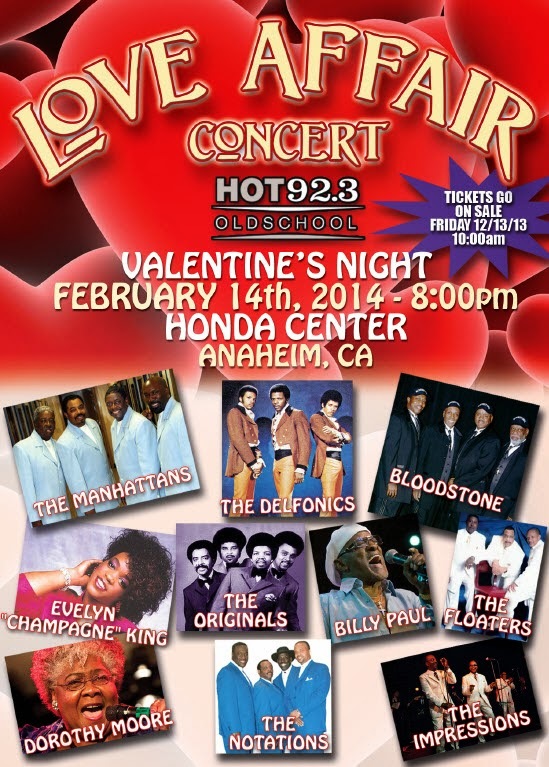 Make reservations via 714-704-2582 or clubreservations@hondacenter.com. 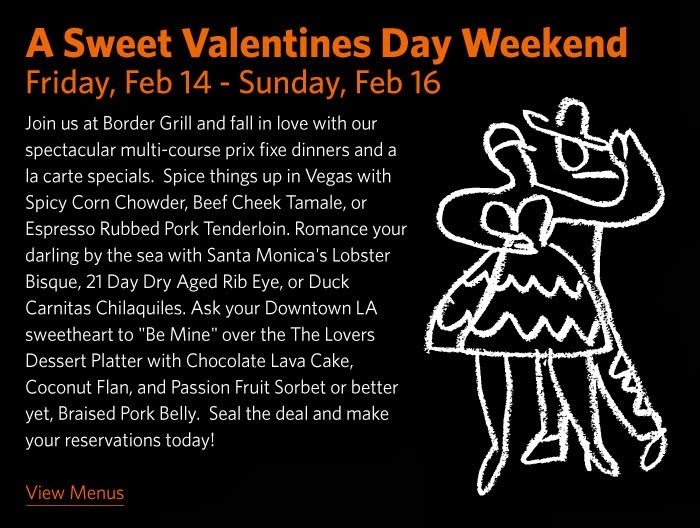 The Eats: The Border Grill is offering a four-course, prix fixe dinner for the weekend, with favorites such as Coconut Flan, Empanadas, Tamales and more. Good for: Anyone who likes Mexican food with a California flair. The 4-1-1: If you’ll be in Vegas, there’s also a Border Grill there that will offer this menu all weekend long. I’ll Be Back…: Because Border Grill certainly knows how to bring in a celebration. From special dinners with Chef Mary Sue Milliken and Chef Susan Feniger to a fantastic Sunday brunch every week, there’s always something exciting and festively unique going on at Border Grill. The Eats: For the entire month of February, a four-course menu by Executive Chef Sydney Hunter, inspired by classic tales of literary couples, including The Great Gatsby’s Jay and Daisy (The Waldorf Salad); Romeo and Juliet (Gnocchi & Truffles); and Brokeback Mountain’s Ennis and Jack (Cowboy Steak). Themed desserts also included. The Vibes: Twinkling lights and 100-year-old olive trees makes you feel as though you're in an airy garden café. The 4-1-1: This menu is in partnership with the Los Angeles Public Library, adjacent to the café. After lunch or dinner, continue the literary theme by visiting the library and checking out the actual books that inspired the menu. Also, guests visiting Saturday and Sunday Feb. 15-16 can receive a complimentary bottle of founding Chef Joachim Splichal’s signature cuvee. I’ll be back: Because I'm in love with this little café. It’s the perfect place to people-watch as Angelenos walk throughout the park right next to it and to also experience exceptional service and fantastic dishes. The Destination: The City of Saint Paul recently made No. 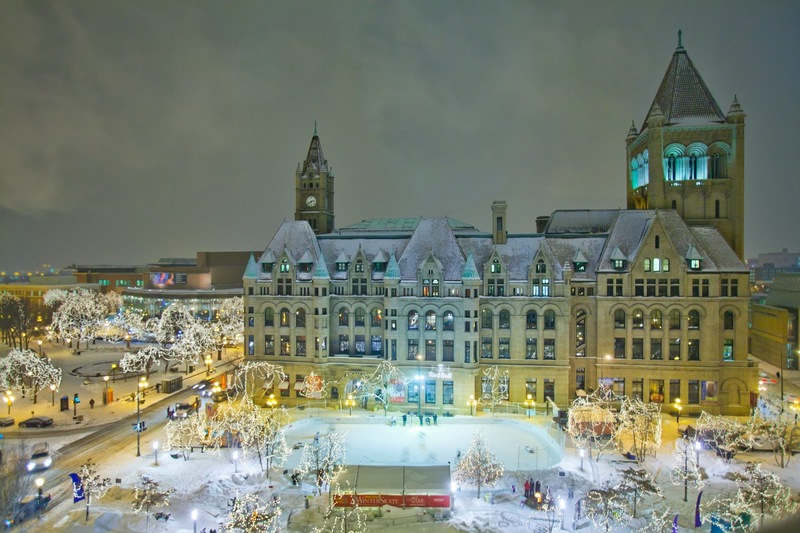 1 on the "Best Romantic N. American Getaway" by 10best, a division of USA Today Travel, and to celebrate, Visit Saint Paul is offering a Valentines Day trip giveaway for two. The trip includes: Delta Air Lines airfare, two nights at The Saint Paul Hotel, private car service, and gift certificates to select museums, attractions and restaurants including Pazzaluna, The Downtowner Woodfire Grill, The Liffey and Mickey's Diner. Good for: Anyone itching to get out of Los Angeles for a change of scenery. The $ Factor: FREE, if you win, and, it costs nothing to enter. The 4-1-1: Enter the contest here. I’ll Be Back…: I absolutely adore Saint Paul, for its small-town charm, its adorable neighborhoods and cozy feel. A wonderful winter escape indeed! *Disclaimer: I work for the parent company of the company that is promoting this show. I am not affiliated with the concert in any manner. All images are not my own; photo credit for Saint Paul: Visit Saint Paul.